Librarians and library advocates have a key role to play in educating our communities about why libraries and librarians are essential in an information society. To be effective, they must speak loudly, clearly and with a unified voice. Democracy needs libraries, and libraries need advocates. SELCO/SELS is proud to be an advocate for libraries both at home and on the national stage. Assist in strengthening the advocacy skills of the SELCO/SELS Board of Directors and member library staff. 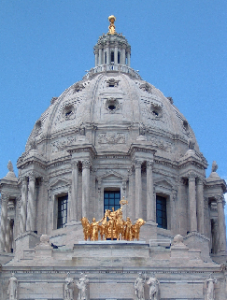 Minnesota librarians will spend the day developing and discussing possible legislative priorities, opportunities, and challenges for the upcoming session. SELCO staff books appointments with the legislators from the SELCO/SELS region. Everyone is free to join the office visits on Legislative Day. In addition, we develop information packets for each legislator and arrange carpooling to the Capitol for the day. ALA’s 2019 Annual Conference will take place in Washington, D.C. June 20-25, 2019. Because of that, the next National Library Legislative Day will occur in 2020. Information can be found on the National Library Legislative Day website from the American Library Association (ALA). Visit the website for basic information, links to resources, and videos that explain the legislative process. You can find the 2019 MLA/ITEM Platform draft here. The planks have been approved but language and numbers may change as Library Legislative Day approaches. For previous years’ materials please consult this Advocacy Archive.